The motor will be found in your catalog in the Hobbies/Knowledge section. 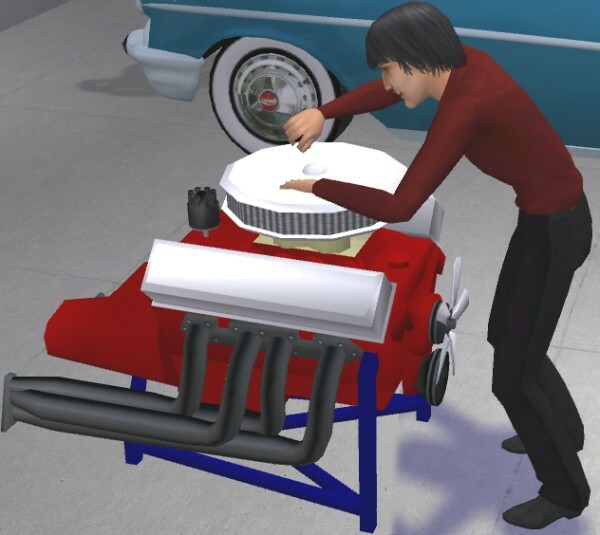 Your Sims can gain mechanical skill points by working on this car engine. This isn't a "cheat" object, skill will be gained in the usual way. The engine requires a flat 4 tile area for placement. Included in the download is the Mesh plus the color options. The mesh file is NOT to be altered or used as a base for other meshes! However, the original motor mesh was over 20,000 polys, so I re-made it from scratch using the original mesh as a reference. Very cool idea. Thank you for sharing! Brunswick Industry: Canadian Pride, Canadian Quality ! My sims will love you!!! Thank you for this wonderful engine, looks amazing! cool, something else to give mechanical skill beside reading a book. Will they get fun from working on the motor? Now THAT is genius! What a great idea!And if you dont need anymore mechanical skills it still serves well as a prop!EXCELLENT! Ooo, I wonder how these will look with Khaki's chains. My brothers always seemed to have an engine hanging from the garage rafters by some chains. With the skill building it's useful garage clutter! Thank you! Thank you so much, I like when my sims can do something new and don't waste time in lazy things (hehe). Kiss and ciao. Fabulous! 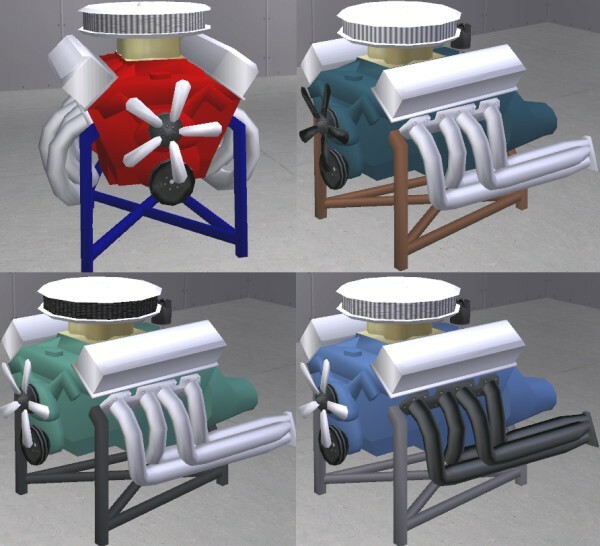 Even Sims must love to tinker with their engines, right? My dad retired this Sunday, and what has he done since? Spent every day in the garage, modifying a car for racing... With a brother that's equally nuts about cars and engines I know a lot more about every tiny little part in the engine than I ever wanted to - and now my sim kids can too (yes, they probably can't use this magnificent engine, but their parents will talk about it at dinner, right?). Unfortunately you're right, kids can't use it. But it is available to teens, as well as adults, young adults, and elder Sims. I just thought they should be able to learn mechanical by "doing", as well as reading it in a book. Finally, my sim men can be just like my ex-boyfriends - I'll put this right in the middle of the living room floor. oh and JLonier you're right, i'll play with this now and see if my chains match up and I'll whip out a set to match if I need to.. Finally my redneck sim's life is complete! I'm outta here like I'm on fire! Good idea to install into the garages to work out with! about time somone comes up with car related items.... Now what would be great is if someone could make a roll around tool box like the big snap-on or mac tool chests. and have it do the same thing as this motor..... That way you could create your very own mechanics shop in your home. Have you supported a FREE sims site today? ooo, how did i miss this treasure? thanks a lot! I love your stuff. This is so awesome. As a motor head, my sims are now uber pleased. Ha, yeah that would be cool. - And too bad it's a Chevy engine. (just kidding I like Chevy) This is great. Good job.